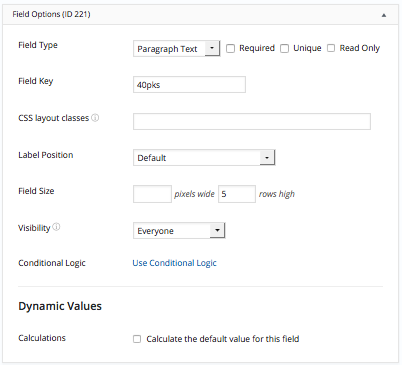 Paragraph Text fields are used to insert multiple lines of text, such as a description or request. The text box size can easily be adjusted by the user by clicking and dragging the bottom right corner of the box. Display the value submitted in a Paragraph Text field in a form's confirmation message, email, or View. Display text: Display the submitted text. Paragraph tags will be added automatically. Replace x with the ID or key of the Paragraph Text field. Text without paragraph tags: Display the submitted text without automatically adding paragraph tags. Require a minimum, maximum, or range of words (or characters) with the frm_validate_field_entry hook.